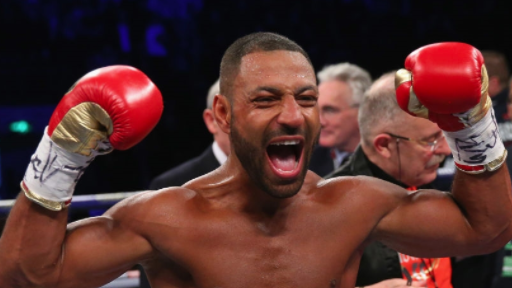 Former IBF Welterweight Champion Kell Brook will return to the ring on Dec. 8 in Sheffield, England, confirmed by his promoter, Matchroom Boxing’s Eddie Hearn. Brook was scheduled to compete earlier this summer but was forced out of action with an ankle injury. He made his junior middleweight debut this past March, scoring a second-round knockout of Sergey Rabchenko at the Sheffield Arena. The fight with Rabchenko was Brook’s first since back-to-back losses in 2016-2017 — when he stepped up to middleweight for a failed title bid at Gennady Golovkin before losing the IBF title to Errol Spence Jr.
Brook is aiming for a fight with British rival Amir Khan, which is now more doable with both men competing under Hearn and Matchroom. After a two-year layoff, Khan returned to the ring this year with a quick knockout of Phil Lo Greco before overcoming a knockdown to take a decision against Samuel Vargas. Khan has called for a rehydration clause to be put into a contract for a match between the two British fighters, but Brook has dismissed that. However, the fight is expected to be contested at 147.